My apologies. These words of wisdom were destined for last week. I had written the first few paragraphs to give you a heads up not to miss the show of a life time. A sprained wrist, however, interrupted my typing and I had to let a deadline pass. So here is what was intended for last week with a few fresh concluding paragraphs. What’s up? Has Putin poisoned another defector? Has Mueller uncovered the smoking gun that will lead to the impeachment, imprisonment, and bankruptcy of our President. 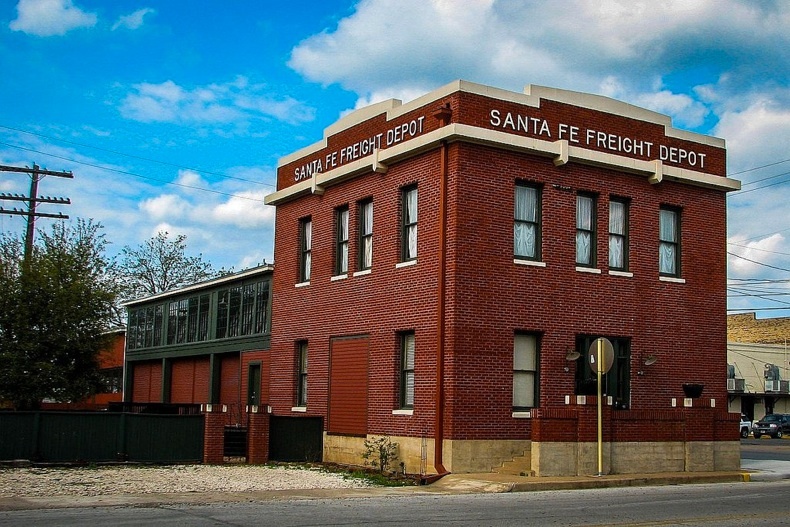 The Santa Fe Freight Depot still stands in Brenham, Texas. It was originally built in 1925, and is currently used as a box office, administrative office, and set design studio for the Unity Theater. This building was originally built for the GC & SF (Gulf, Colorado & Santa Fe) Railroad, and is at its original location. I have been out of the news loop for 72 hours or so. My current thought and interest are focused on “Visiting Mr. Green,” the current production at Unity Theatre. This is by far the best and most provocative of the many excellent productions that I have enjoyed at Unity. I will not give even a hint of the theme of the show. Any attempt to discuss the plot would detract from your anticipation for each new scene. Those lucky enough to enjoy one of the four remaining performances (unfortunately ended its run Sunday) will see what this and the next paragraph means. In each of the nine scenes, a thread of the tangled ball unravels just a bit more. Then comes the unanticipated, surprising climax with an almost audience gasp as the stage fades to black. We are so fortunate to have Unity Theatre. There are very few, if any, towns or cities the size of Brenham that are home to a professional theatre comparable to Unity. The productions here are professionally produced, directed, and acted. So it is beyond comprehension to see empty seats in the audience during some of the plays. Is there a large segment of the population that does not know that we have a professional theatre in our midst? Or are there some who think what is presented there is just another grade school attempt at acting. There may be others who think nothing here will compare with re-runs of “The Golden Girls” or the current professional athletic event. Thoughts like those lack reality. Thirty-five years ago, I had season tickets for the Alley Theatre, one of the professional theaters in Houston. What I see at Unity Theatre, right here in my back yard, equals or exceeds anything I enjoyed in Houston. Even if the current feature at Unity does not spark your interest, it is worth the price of admission just to see the stage setting. I am anxious to take my seat for each performance just to see what the stage magicians have come up with this time. For example, in a recent production set in Vietnam, I was flabbergasted to walk in and see that the stage was a bamboo grove. The large bamboo stalks looked just like the ones I had seen in Vietnam 40 years earlier. Later, I learned the bamboo “stalks” were simply sections of PVC pipe glued together with joints to give that recognizable bump and eerily painted to look just like growing bamboo. In another show involving an early American theme, I was fascinated by the antique dental chair in use. I could not imagine where they had found such an artifact, only to learn that the local crew had built the chair from an ordinary metal kitchen chair. Then there was the set for “Visiting Mr. Green.” You walk into a beautifully appointed, but modest, apartment in NYC in the 1950s. Eventually your gaze falls on the wall beside the front door. There is something odd there. Something seems to be missing. There is a light colored stain on the wallpaper between the two sconces. Finally, in the next-to-last scene, the portrait that had hung in that spot for years and kept the light from discoloring it as it had the rest of the wall was brought out and rehung. The portrait and frame were a perfect match for the discolored spot. Designing and building sets are just some of the professionalism you will see at Unity Theatre over and above the professional acting. If you have not discovered and enjoyed the professional entertainment at your door step, it is time for a pleasant surprise. Get in line now for season tickets. The next performance, “Becky/s New Cat,” begins at Unity Theatre on April 19.